What does Your Business Transition Plan Look Like? As a business owner, you are constantly involved in the process of adding value to your business by nurturing customers, maintaining your bottom line, and taking care of the day-to-day operations. However, if you are like most business owners, you have likely given little thought to the important task of unlocking the vault of business wealth through business transition planning. When you decide to retire, your role as business owner – along with all your ownership tasks and responsibilities – will also need to retire and transition to new ownership. Have you considered how you will protect your business value, your employees, as well as your overall legacy? A business is like a vault. Over the years, you accumulate and lock up value inside your business, which will require a strategy – a combination of sorts – to access that accrued value when you decide to retire or leave the business. Whatever your exit strategy objective and business transition needs, we can help! Using a seven-step process called Unlocking the Vault, we have helped hundreds of business owners just like you define their exit strategy objectives, isolate any problem areas that need to be addressed to ensure a smooth and seamless transition, and establish the most appropriate and lucrative route for their business transition journey. 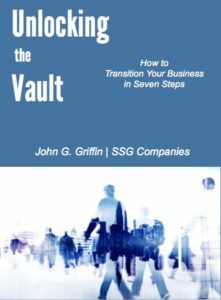 To learn more about the SSG Seven-Step Business Transition Process, download our free ebook – Unlocking the Vault…How to Transition your Business by visiting UnlockingTheVault.info.